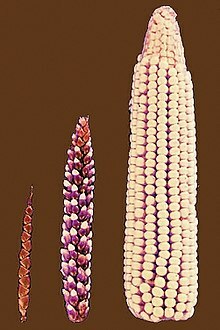 Selective breeding transformed teosinte's few fruitcases (left) into modern corn's rows of exposed kernels (right). The agriculturist selects his corn, letting grow as much as he requires, and tearing out the remainder. The forester leaves those branches which he perceives to be excellent, whilst he cuts away all others. The bees kill those of their kind who only eat, but do not work in their beehive. Slow though the process of selection may be, if feeble man can do much by his powers of artificial selection, I can see no limit to the amount of change, to the beauty and infinite complexity of the co-adaptations between all organic beings, one with another and with their physical conditions of life, which may be effected in the long course of time by nature's power of selection. 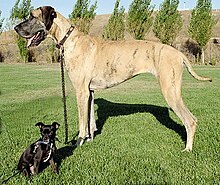 We are profoundly ignorant of the causes producing slight and unimportant variations; and we are immediately made conscious of this by reflecting on the differences in the breeds of our domesticated animals in different countries,—more especially in the less civilized countries where there has been but little artificial selection. ↑ Buffum, Burt C. Arid Agriculture; A Hand-Book for the Western Farmer and Stockman , p. 232. Accessed at , June 20, 2010. ↑ Lush, Jay L. Animal Breeding Plans , p. 21. Accessed at , June 20, 2010. ↑ Garland T, Jr., Rose MR, eds. (2009). Experimental Evolution: Concepts, Methods, and Applications of Selection Experiments . University of California Press, Berkeley, California. In press.